In 2007, I relocated for a month to New Orleans to write my first book with award-winning designer and book publisher, Phillip Collier. Mixing New Orleans covers the history of the cocktail in New Orleans in both in picture and prose, with more than 100 historical images and rare interviews with some of the most noteworthy characters in the city. The book is divided into three major sections, covering the intriguing and sometimes illicit birth and rise of the cocktail, the city’s famous watering holes and their signature cocktails and famous imbibers who were well known for both literature and libations. From the Sazerac to the Pimm’s Cup, from the Hurricane to Absinthe’s reign, Mixing New Orleans takes readers on a journey of education and understanding of the vital role the cocktail has played in shaping the unique character of New Orleans today. The book debuted in 2007 at Tales of the Cocktail – a five-day, annual festival celebrating cocktail culture – where it was nominated for “Cocktail Book of the Year.” To date, it has sold out of its original printing of 7,000 copies and is now in discussions for reprint. 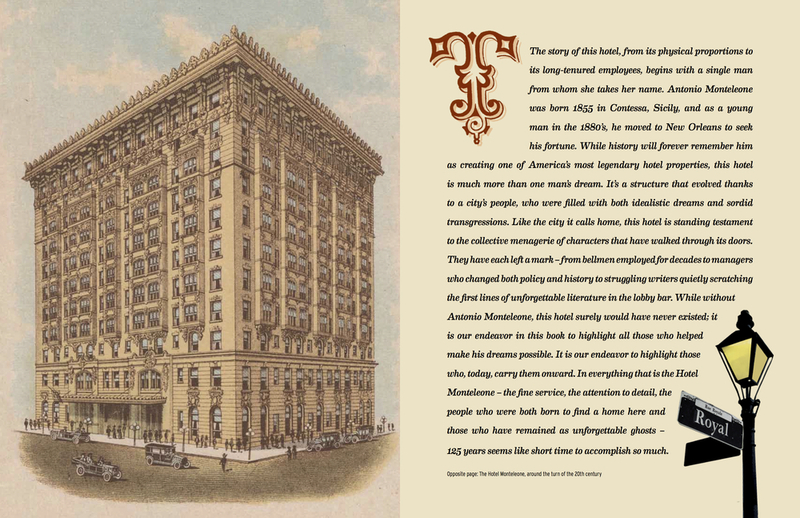 In 2010, I was contracted by The Hotel Monteleone to write the first-ever history of the property. Phillip Collier and I teamed up once more, and the hardback book published in January of 2011, in conjunction with a massive celebration of the hotel's 125th Anniversary. The Hotel Monteleone is iconic to New Orleans and to America, not in one single aspect, but in many. This book is filled with early historical accounts of the French Quarter and the hotel's visionary creator, Antonio Monteleone. The pages contain humorous memories from notable authors like Richard Ford, Tennessee Williams and Eudora Welty. We researched historical figures like Liberace and Louis Prima, and their nights entertaining guests in the old Swan Room and the famous Carousel Bar. Music and celebration are woven in the fabric of this hotel and its story as much as in the town of New Orleans itself. This book is another form of celebration. It's a testament and a thank you to the cast of people who have helped shape the Hotel Monteleone's amazing history.